Learn how to conduct a marketing audit that allows you to identify the strengths and weaknesses of your existing marketing program and optimize your efforts across the board. When it comes time to optimize your marketing, it’s vital to establish a baseline of your current marketing activities to define exactly where you stand, where you want to be, and how best to reach that goal. A marketing audit is a perfect way to establish that information. In the following three sections we’ll walk you through the steps you’ll need to take to audit your existing marketing efforts and identify the strengths and weaknesses of each component. With this information clearly defined, you’ll be able to set SMART goals and make far more effective optimizations to reach them. Your website is the foundation of your digital marketing program for the simple reason that every marketing action you take will lead people back to your site. As such, it’s vital that your site is optimized around your marketing goals. When it comes to making adjustments to your marketing to bring about quick wins, everything you do will be made more effective if your website is made to be more effective. While it may seem like website redesign falls outside of the scope of a “quick win,” we’re not talking about a full redesign (although it still may be the best idea depending on the state of your current site). By conducting a website audit you’ll be able to identify the weak points in your site, then segment them in order of priority based on your ability to quickly implement optimizations to “fix” them. This way you’ll have a list of fast and easy modifications you can implement to start seeing results right away. Now let’s look at the steps to conducting a website audit. The first step is simple. The whole point of this audit is to put your website’s issues on paper, so create a Google doc, sheet, or any type of document that you like to work in to help you organize your findings. Once you have your document ready, it’s time to get started. Your homepage is your most impactful page and the most important page to get right. Not tracking with a Pixel for Facebook, AdWords, etc. These are a few of the most common issues we see. Of course, there will be more based on your unique industry and business, so be sure to itemize these unique issues along with the ones listed above. Work your way through each of the main pages of your website and identify whether similar issues exist. Be sure to distinguish which pages have which issue(s). You may find it easiest to create a separate tab, column, or row for each page of your site, as well as to include some page identifiers next to each issue to help you. For example, HP for the homepage. Now that you have a list of issues, it’s time to sort them into quick wins and those that will require more resource investment and should be tackled at a later date. A great way to do this is to assign each item a pair of scores. The first is the importance of the task based on the impact it will have. Assign a score from 1 through 5, 1 being top priority. The second score you will assign is the amount of time and resources it will take to implement. In this case, a 1 is the least amount of time and resources and a 5 is the most. By the time you’re done assigning scores to each item, you’ll be able to look for those with the lowest combined scores to identify your quick wins. Again, they’ll be the high priority, most impactful items that require the least amount of resources to implement. For example, depending on the number of optimizations on your list, you may choose to start by implementing all items with a combined score of 4 or less. The way you assign scores will be dependant on a variety of criteria unique to your organization. You’ll have to determine whether budget represents as much of a constraint as time or vice versa. For example, let’s say your homepage needs to be completely redesigned to make your newly optimized marketing more effective. It may be one of the more costly items on the list, but without it, the rest of your marketing won’t carry as much momentum as visitors arrive at your site. In this scenario, the more time you wait to get the homepage to where it needs to be, the more money/potential business you’ll be losing from your marketing. The scoring system you devise should be based on your unique resources and needs. Once you’ve figured your own scoring system out you’ll be ready to start implementing your quick wins. Now that you understand the process, let’s take a look at some of the most common issues that you’ll want to pay attention to when conducting your website audit. Paid advertising is a numbers game. Either your ads are hitting their marks or they’re not. Even if you’re seeing positive returns from your advertising, we’re willing to bet there are still plenty of quick win opportunities that you haven’t explored. Let’s look at the process of the paid advertising audit. While you can create a multi-page document to house all of your audits, we recommend creating a unique document to store your findings. Create a report for the previous 60-90 days for each of your accounts and import them into your spreadsheet. If possible, keep the majority of the metrics you’re tracking the same to establish some uniformity. Depending on your marketing goals, establish priority metrics for each of your accounts. These are the most important metrics that will help you to achieve your marketing goals. The whole point of a marketing audit is to better understand where your current marketing sits so that you can determine how to get to where you want to be. Once you have your reports in your spreadsheet and you’ve defined your priority metrics, it’s time to establish goals for where you want those metrics to be. Then determine the gap between where they are and where you want them. Use the combination of your priority metrics and the gap you just identified to help you determine where you can make small optimizations to get your metrics where you want them to be. For example, if your current ads are converting people once they get them to the website, but are having a tough time getting people to click, simple advertising optimizations may be all you need to drive down your cost per click/conversion. If your ads are getting lots of clicks but not converting people when they get to the website, you may need to identify whether or not your website is to blame. Remember, this is a lesson in marketing synergy. Paying attention to how small changes affect your entire marketing program is the key to making dramatic improvements with less resource allocation. Sure, this guide is about conducting a Facebook Marketing Audit, but much of what you learn here can be translated to other paid advertising platforms. This post gets into the nitty-gritty details of conducting a full Facebook marketing audit, so be sure not to miss it if you’re serious about optimizing your Facebook and other paid advertising accounts. Content marketing CAN be a highly effective way to drive traffic to your site, convert those visitors into leads, and nurture those leads into sales. However, to be truly effective this process requires you to construct a full inbound marketing funnel. There are plenty of places to create gaps and sticking points along the way and a content audit is a great way to determine where you need to work to make improvements and optimizations. The first part of the content marketing audit is gathering the relevant data on all of your existing content pages. This is made possible with the help of tools like Ahrefs, SEMrush, or Deepcrawl. By simply entering your domain into the tool you’ll be able to pull the URLs for each of your pages, along with information like the number of backlinks they’ve earned, the referring domains, and the keywords they rank for. These tools also allow you to export this data into a spreadsheet like Google Sheets or Excel. This way you can organize your pages and identify action items for each. Once you have all of the pages in one place, it’s time to go through them and determine what action items you’ll assign to them. Some of your content may be great, providing tons of value to readers, earning backlinks, and driving traffic. Others may be a bit more mediocre, not driving much traffic and not having earned backlinks. These probably don’t provide much value to your readers. You’ll also want to identify additional keywords you may be able to rank for and sprinkle them into your post. Using latent semantic indexing friendly keywords is a great way to earn more traffic from each post, AND provide Google with the context it needs to understand what your article is about. You may find that you’re able to combine two or more pieces of old content into a single “super post.” If you have old posts that aren’t strong enough to rank or provide much value on their own, look for ways to combine them with other relevant posts to create more comprehensive resources or mega guides. You may not think of deleting your hard work as optimizing your content, but it certainly can be. If your posts don’t provide much value to their readers, they could have the opposite effect and actually reflect poorly on your brand. This also holds true for the way Google views your content. Short, “less-than-valuable” posts can actually hurt your rankings. If your site is full of posts that nobody is reading and your visitors don’t care for, Google takes that as a sign that your content isn’t worth showing in its organic rankings. It may even determine that your site as a whole has less domain authority and is less worthy of these coveted rankings. Finally, some of your content may be old or outdated, time/date sensitive and not possible to bring up to date. Anything that has to do with the out-of-date information should be removed from your site. Take the time to delete these pages and you’ll be delivering a better user experience, more value to your visitors, and helping Google see only your most relevant and valuable content. Once you have all of your blog pages in one place and the action items for each, it’s important to understand where that leaves your inbound marketing funnel. A full inbound marketing funnel is a highly complex machine, and you will inevitably be able to identify several gaps in yours once you’ve completed the first part of your audit. 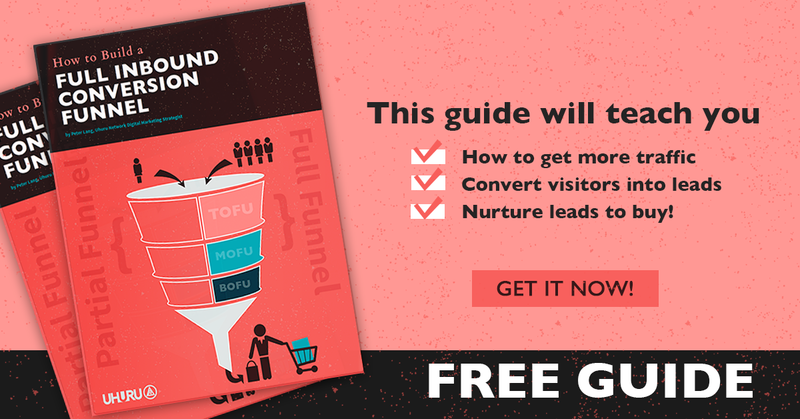 If you’re not already familiar with the concept of a full inbound marketing funnel, be sure to read this guide. Look for gaps in each stage of the funnel for each of your buyer personas. For example, you may have several MOFU and BOFU articles directed at your main persona, but lack the TOFU content to drive the traffic and earn the initial interest that brings them into the funnel in the first place. You may even have TOFU content offers on your website, but lack the MOFU and BOFU content to link to that will keep your prospects moving through the funnel. Whatever the case, be sure to document the pieces you have for each persona and where they fit into the funnel, as well as the pieces you still need to create. Content marketing is an effective way to drive traffic to your website, but driving traffic is only a single piece of the puzzle. In order to make the most of that traffic, you’ll need gated content offers in place to capture contact information and convert visitors into leads. This step of the content marketing audit process is all about identifying whether or not those lead-generation opportunities are in place and if they are being used most effectively. By using a diagram like the one above you’ll be able to identify whether or not you have the right offers in the right stage of the funnel for the right persona. Remember, these offers should be persona-specific. If you created your offers to be “one-size-fits-all,” it’s likely they won’t be as effective. Once you’ve identified the gaps in your content marketing program, it’s time to schedule the creation of new content to fill in the gaps and complete your full inbound funnel. The best way to go about this is to identify quick wins or actions that require the least amount of resources to make the most impact. For example, let’s say your main persona funnel only needs a single content offer and two blog posts to be complete, while your secondary persona requires two offers and four blog posts to be complete. It would be important to prioritize the creation of all of the content assets for your main persona before you created anything for your secondary persona. This way you’ll be able to eliminate any gaps in the buyer’s journey and get your main persona funnel working properly before putting your resources into your next persona funnel. A marketing audit is the first step to fully optimizing your marketing program. While it may make sense to work through one of these audits at a time, completing a full audit will likely uncover related gaps and inefficiencies that relate to other components of your marketing program. Whichever way you choose to go about your marketing audit, be sure to document everything you discover. The key to understanding how to improve your marketing lies in gathering a deeper understanding of where you currently stand. From there you’ll be able to prioritize the action items necessary to reach your goals and, more importantly, have a thorough understanding of how you achieved your outcome. Super post. I like the image of the funnel diagram. FYI, the link goes to the StylishlyMe Power Page Designs, but I don’t see the funnel diagram there. Maybe it’s there and I missed it. Anyway, very nice outline of the audit process.